Defending the Delaware: Fort Mott ~ The History Girl! In Salem County, New Jersey exists an earthen and concrete fortification on the Delaware River. Built in the late 1800s, this fort worked in conjunction with two others to protect the Delaware River and Philadelphia upstream from enemy attack. Although never used in battle, the fort served as a training ground for thousands of troops in the late nineteenth and early twentieth centuries. Today, the desolate and partially restored fort serves as a reminder of America's once-ambitious bricks-and-mortar domestic defense program and of New Jersey's role in protecting the United States from foreign attack. Since the time of the Revolution, it was determined that the area where the Delaware Bay meets the Delaware River near present-day Pennsville would be the best location to build fortifications to protect Philadelphia, the industries along the river, and Trenton further upstream. In 1837, land was purchased by the federal government from John G. Mason along the Delaware River in New Jersey at what was called Finn's Point. A fort had already been constructed in the center of the Delaware River on an island known as Pea Patch. As early as 1794, the French military engineer Pierre Charles L’Enfant had surveyed the island and recommended its use as a defensive site. This island was used as a private hunting ground by Dr. Henry Gale, a New Jersey resident. Gale was offered $30,000 for the island by the U.S. military, but he refused. The military appealed to the Delaware state legislature, which seized the island from Dr. Gale on May 27, 1813. Construction on a fort began in 1817 on the island and was replaced by the present Fort Delaware, which was constructed mainly between 1848 and 1859, becoming the largest third-system fortification completed in the United States at the time. It was declared completed in 1868. On the other side of the Delaware, a battery was constructed between 1863 and 1864. During the Spanish-American War and the following years, the government upgraded the defense capabilities in Delaware and renamed it Fort DuPont in honor of Rear Adm. Samuel Francis Du Pont. The new fort in Delaware was built during the Endicott era. Back in New Jersey, the original plans for a fort on the Delaware River dated to the 1870s. Plans called for eleven gun emplacements with twenty guns and a mortar battery with six emplacements for Rodman Smoothbore guns. Construction began in 1872 but only two of the emplacements and two magazines in the mortar battery were completed by 1876 when all work stopped for reasons still unclear to historians. The magazines still survive from this uncompleted project. In the 1890s, the United States realized the importance of bolstering its defenses. As Fort DuPont was being upgraded, construction began on the New Jersey side in 1896. On December 16, 1897, the fort was named Fort Mott, in honor of Major General Gershom Mott, of Trenton. Gershom Mott had served with distinction as Second Lieutenant in the Tenth Infantry in the Mexican-American War, as Lieutenant-Colonel in the 5th New Jersey Volunteer Infantry, as Colonel and commander of the 6th New Jersey Volunteer Infantry before he was promoted to first Brigadier General. He was wounded four times, resigned from the Army in 1866 and died on November 29, 1884. Five Endicott Period batteries were built at Fort Mott between 1897 and 1902. When completed, Fort Mott was mounted with twelve guns: Battery Arnold (three 12-inch disappearing guns), Battery Harker (three 10-inch disappearing guns), Battery Gregg (two 5-inch rapid fire guns), Battery Krayenbuhl (two 5-inch rapid fire guns), and Battery Edwards (two 3-inch casemate rapid fire guns). In 1897, construction began on a moat and parados. Parados is a Spanish word meaning "rear door." The parados served as a shield against gunfire from the rear and consisted of an earthen berm over 750 feet long and twenty feet wide at the top. The dirt for the berm came from the digging of the moat. Together, these two obstacles would slow enemy advancement and protect the soldiers manning the guns. Construction of the parados took over two years. Men worked by hand using shovels and wheelbarrows to move over 200,000 tons of dirt for $1.25 per day. Between 1897 and 1905, over thirty buildings were constructed at Fort Mott. The buildings included two large 115-men barracks, commissioned and non-commissioned officers housing, a hospital, post exchange, library, guard house, stable, YMCA, and a school for the soldier's children. In 1901, the property of Edward Sharpe was condemned and the federal government purchased an additional forty-one acres of adjoining land, expanding upon Fort Mott's original 104 acres. Two observation towers were built at Fort Mott in 1902 and 1903. From the towers, soldiers were able to identify enemy ships, calculate speed and distance, and communicate this information to the main plotting room and the guns at Batteries Harker and Arnold. The two 5-inch guns from Battery Gregg were removed in 1913 and sent to Honolulu. The two 5-inch guns in Battery Krayenbuhl were removed in 1917. The two 3-inch guns from Battery Edwards were removed in 1920. With Battery Gregg empty, a reinforced concrete battery commander station was built on emplacement number 1 in 1922. One was also constructed at Battery Krayenbuhl at a cost of $850.00. The commander stations provided a place for the Battery Commander to supervise the operations of his guns, check the work of the plotting room, and observe the gun's accuracy. Troops were regularly stationed at Fort Mott from 1897 to 1922. 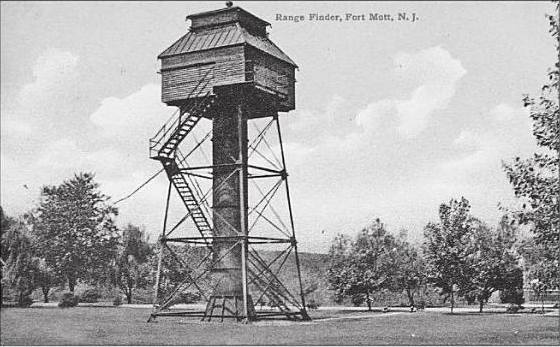 Fort Mott, along with Fort Delaware and Fort DuPont, became obsolete as the principal defensive installation on the Delaware River with the construction of Fort Saulsbury, near Milford, Delaware, shortly after World War I. The federal government maintained a care-taking detachment at the fort from 1922 to 1943. The officers' quarters were removed in 1933 and floated on barges across the river to Fort DuPont. Once it was realized that World War II would not reach the United States, the fort was abandoned by the army in 1944. Both of the barracks buildings and the hospital were dismantled and the remaining armament was removed at this time. Three years later in 1947, New Jersey acquired Fort Mott and the surrounding 104 acres as a historic site and State Park for the sum of $14,000. Fort Mott State Park opened to the public on June 24, 1951. In 2006, tragedy struck Fort Mott. The historic 1904 Peace Magazine was all but destroyed by arson. The Peace Magazine is a well-ventilated storehouse for powder. The batteries were often damp, which effected the strength of the gun-powder. The best place to store powder during peacetime was in this well-ventilated, brick building. It was quickly rebuilt using historically-accurate lumber and methods. The Peace Magazine is the only existing magazine of its kind built by the army remaining in the United States. Over the past few years, other areas of the fort have seen rejuvenation. Currently, the failing concrete on Battery Arnold is being replaced and waterproofed on emplacements 1 and 2. The next area to be conserved will be emplacement 3 at Battery Harker. Over the next five to ten years, the State of New Jersey expects to restore all of the concrete as long as funding remains in place. In addition to the Peace Magazine and two observation towers, other remaining buildings at Fort Mott include the 1902 Post Headquarters, 1903 guardhouse, and 1901 ordnance building. Fort Mott remains part of a unique military installation. Although not as complete as it once was, it demonstrates the complexity and importance of the three-fort system on the Delaware Bay and reminds visitors of the real threat of attack that once faced our nation. Although guns were never fired here for anything other than training, the hollow caverns and gun encasements echo the sentiments of soldiers long gone who prepared day and night to defend New Jersey and the nation.